It's powered by a Euro 4 compliant liquid cooled 1,200cc parallel twin engine, producing 96.6bhp at 6,750rpm and maximum torque at 4,950rpm. RRP was £11,700 in 2016 and £12,200 in 2017. Both Thruxton models are based on the Bonneville T120 engine and chassis but with an emphasis on power over torque, which is great news for accessory compatibility and range. In many ways the Thruxton is a T120 with up swept exhausts, low clip-on bars, bar end mirrors and cafe racer style hump on the seat. The 17" wire spoked wheels take a Pirelli Diablo Rosso Corsa 120/70 tyre at the front and 160/60 at the rear. 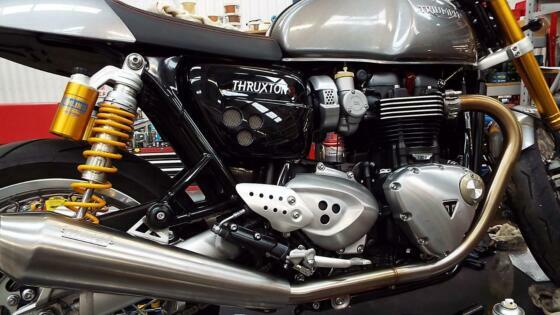 The less expensive Thruxton doesn't get the brushed Stainless Steel exhaust system, Brembo brakes at the front, Showa Big Piston fork, Ohlins rear suspension, pillion seat cover/hump, clear anodized swingarm or red seat detailing. It comes with Pirelli Angel GT tyres and is 3kg heavier. Accessories include heated grips (£189), cruise control, mini cafe racer fly screen (£72), full cafe racer fairing (£680), Vance & Hines performance exhaust kit, lower clip-on bars, panniers, comfort seat and bullet indicators.